When my mom was here, she made pan fried chicken wings a couple of times and my hubby was hooked. My mom makes the best pan fried chicken wings - they are crispy on the outside and juicy in the inside. So when I asked her for the secret recipe, she simply said "Patience". Huh? I didn't understand what she meant until now. My first batch of chicken wings was a bit burned as I was tired of flipping the wings and decided to turn the heat up to speed up the process - big mistake! So I threw in an extra dose of patience for my second and third batches, and they were simply brilliant. It is a great way of meditation as you can simply let your mind wander while flipping the chicken wings. 1. Marinate the chicken wings with thyme and salt and pepper for at least an hour. 2. Heat some olive oil in a non stick pan and fry the chicken wings in batches over medium high heat. 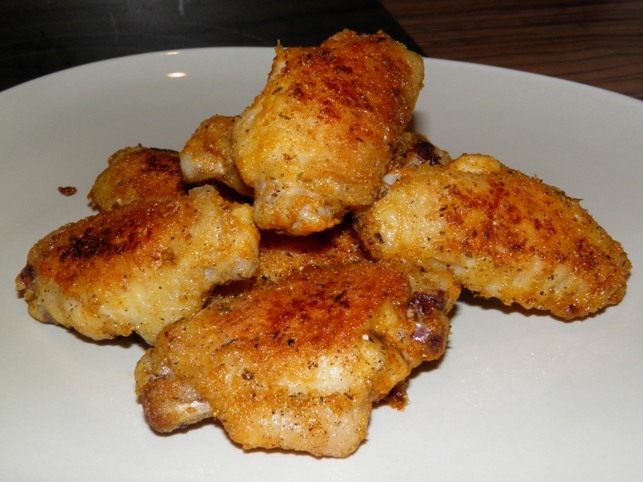 Cook the chicken wings for about 15 minutes, and remember to turn them every 2-3 minutes. Sprinkle some salt over the wings halfway through for extra crispness.